In one weekend, sophomore Greta Wilker may catch a softball doubleheader and board a flight to compete in a shot put event the next day. 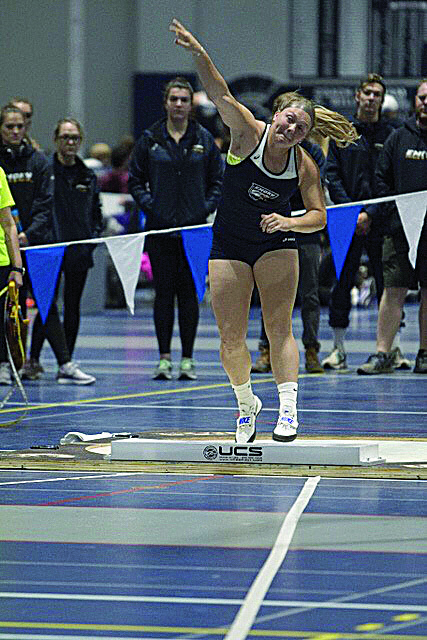 The two-sport Emory athlete boasts seven RBIs, a home run in seven games played and the title of top finisher in the shot put event in the University Athletic Association (UAA) Indoor Championships. 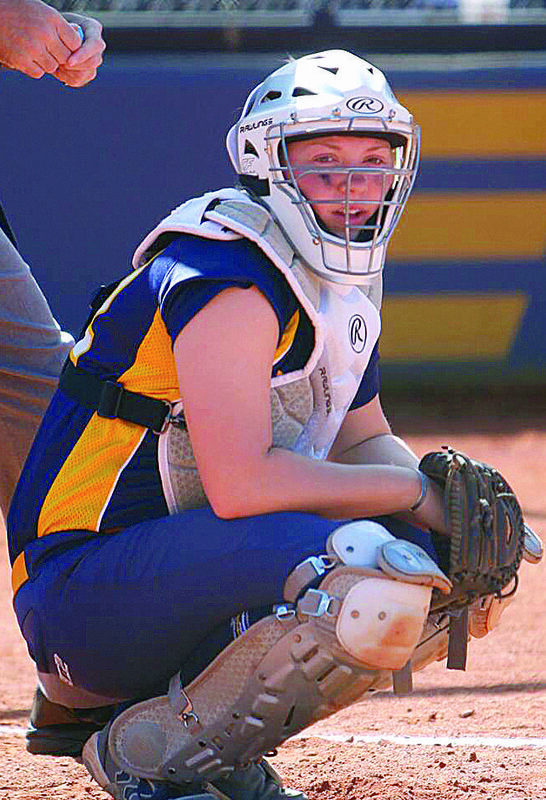 Wilker committed to Emory’s softball team as a catcher, and she found herself a star athlete on both the softball and track and field teams her sophomore year. Juggling multiple sports is familiar to Wilker, who competed as a four-sport varsity athlete in high school. In her home town of Belding, Mich., Wilker was a member of her high school softball, track and field, volleyball and basketball teams. Wilker spent her freshman year at Emory as a single-sport athlete, making her collegiate debut on the softball team. She kicked off her softball career with a bang, knocking a solo homerun over the fences in her first at-bat as an Eagle. During Wilker’s first year, she started in nine of the 18 games she played and amassed three hits and four runs in 21 at-bats. With the softball and track and field seasons on the horizon for the Spring 2018 semester, Wilker had intended to only compete on the softball team again her sophomore year. But after a conversation between Siqueiros and track and field Assistant Coach and throwers coach Luke Johnson, Wilker realized she could feasibly compete in both sports. After Johnson evaluated her shot put throws, he added Wilker to the team. Johnson said he looked into bringing Wilker onto the team after Siqueiros approached him this semester and suggested that Wilker could effectively compete in both sports. Eager to compete in multiple sports as she did in high school, Wilker agreed to compete for both squads. Johnson noted Wilker’s desire to keep a busy schedule by playing multiple sports. Wilker, who is majoring in anthropology and human biology, emphasized having a well-planned schedule to keep up with the two varsity teams. Although she attends both practices, she prioritizes softball. In her first shot put competition the morning of Feb. 9, Wilker finished the event as the top NCAA Division III shot putter and No. 12 overall in the Dunamis Super Meet in Emerson, Ga. Her best throw traveled 11.74 meters. That same day, Wilker returned to campus to face off against Birmingham Southern College (Ala.) in a softball doubleheader. While the Eagles dropped the first game of the doubleheader 5-2, Emory bounced back to claim a 5-0 victory in the second. Unfazed by a long day of competing, Wilker launched a solo home run in the bottom of the third. Later that month, Wilker flew to Cleveland for a meet on the night of Feb. 24, just hours after catching two games in a doubleheader against Covenant College (Ga.). The Eagles won both games of the back-to-back, 5-1 and 2-0. 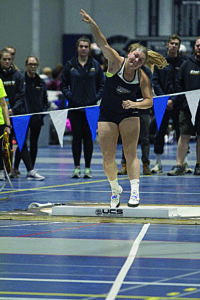 Perhaps in her best athletic performance yet this season, Wilker broke a school record and achieved the top throw in the UAA Indoor Championships at Case Western Reserve University (Ohio) Feb. 25, with a distance of 12.32 meters. Johnson said that Wilker’s natural talent allowed her to have immediate success on the collegiate shot put circuit. With an already busy start to her spring semester, Wilker is primed to have an equally busy few months to follow. The conference portion of the softball schedule lies just around the corner, as does the brunt of the outdoor track and field season. But for a former four-sport athlete, two sports should be a stroll through the ballpark. Or through the track field, in Wilker’s case.